Beatification of Salvadoran Archbishop Oscar Romero? Today at a private audience in the Vatican Pope Francis heard a plea for the Roman Catholic Church’s beatification of Salvadoran Archbishop Oscar Romero. The petitioner was Mauricio Funes, the President of El Salvador. 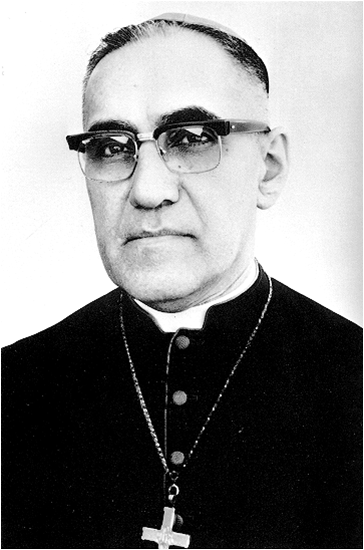 President Funes also told the Pope that Funes had been a pupil of Father RutilioGrande, whose assassination in 1977 had inspired Romero. The Pope apparently responded that Grande should also be beatified because of his love for the poor and for his persecution. Afterwards President Funes met with the Holy See’s Secretary of State, Cardinal Tarcisio Bertone, S.D.B., accompanied by Archbishop Dominique Mamberti, secretary for Relations with States. As a Christian of the Protestant and Presbyterian persuasion, my church does not have official saints. However, I regard Romero as my saint as he already is the saint of the Salvadoran people. My many posts about Romero discuss my belated discovery of him on my first trip to El Salvador in 1989, his powerful, courageous resistance to the many human rights abuses of the Salvadoran government and military, his assassination and funeral, the cases about his assassination in the Inter-American Commission on Human Rights and U.S. federal court and remembering him in music, film, art and books and at Westminster Abbey in London. I also have developed a great respect for Father Rutilio Grande. I attended his memorial mass in 2003 not far from where he was assassinated on a country road and reviewed that memorable occasion in a post. As I understand, beatification is a recognition accorded by the Roman Catholic Church of a dead person’s entrance into Heaven and capacity to intercede on behalf of individuals who pray in his or her name. Beatification is the third of the four steps in the canonization process of becoming a saint. A person who is beatifiedis given the title “Blessed” in English. This post is based upon articles in the Washington Post, Diario Latino, LaPagina and SuperMartyrio, the last of which is a blog devoted to following the process of Romero’s becoming a saint in the Roman Catholic Church.